We are pleased to advise that DKO have been appointed as architects for our West Melbourne project after presenting an ‘out of the box’ concept to deliver a creative and contextual design response for this unique site. The announcement was made following a competitive tender process to ensure that the best possible outcome is delivered for current and future residents of West Melbourne. West Melbourne is a charming suburb nestled on the northwestern fringe of the CBD. Its urban fabric is characterized by terrace housing, former factory buildings in an art deco style and original condition brick warehouses. It has beautifully wide streets lined with mature trees and has retained a quintessentially ‘old Melbourne’ feel. 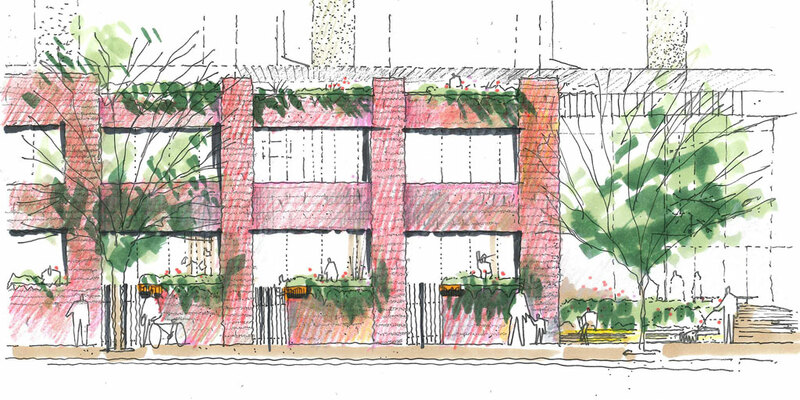 It is PDG’s intention to work within this context to marry the industrial past of the site’s existing building with the progressive movement of West Melbourne, setting a benchmark for good quality, medium density development. DKO’s unique design response acknowledges and draws inspiration from the history of the site, being a former textile and tin factory. This story will be woven into the built form, materiality and spatial planning. Almost 50% of the site will not be built on and a significant portion of the existing building will be retained, restored and repurposed to provide classic West Melbourne townhouse-style residences. This will be complemented by residential apartments which will be designed to meet the objectives of the ‘Draft Better Apartments’ guidelines. The 4,795m2 site is located adjacent to the North Melbourne train station, which due to growing commuter numbers, presents an opportunity to contribute to a growing and vibrant retail precinct. Initial concepts also incorporate cascading terraces which spill over with greenery and provide occupants on multiple levels the opportunity to enjoy city views. This architectural approach is driven by a well-considered response to provide a respectful transition to a lower density residential area to the east of the site. A generously portioned courtyard will also provide a green common space interfacing with the aforementioned ground level retail. We look forward to sharing more detailed plans and conceptual images in the near future. To receive this information directly as it becomes available or to speak with PDG about the project please register your details here or contact us directly on +61 3 9662 9996.